bow of the Ladybird on to the deck of a British destroyer - I think it was the Stuart - without even getting my feet wet! After reading through various items on the net I learnt that an article was published about this event in the Newsletter of the Rats of Tobruk Association. I would very much like to have a copy of that article. Is it possible that some kind person might have a copy of that Newsletter and could scan it for me? By the way my birthday is on the 18th October and I will be 85 if I survive till then! Unfortunately that Association has folded up, shutting that door. I am pleased you have survived thus far reach 85, I am a little behind you at 83, HAPPY BIRTHDAY for the 18th. of October. Stuart was an old Australian Navy destroyer of the V and W Class that saw out WW2. Here is a picture of Ladybird, sitting on the bottom at Tobruk. 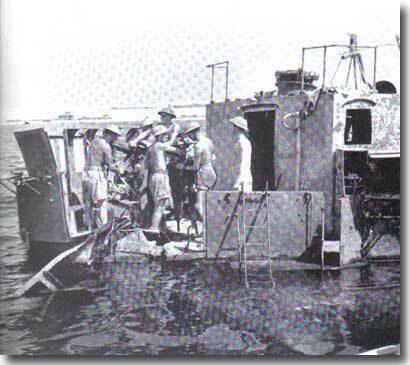 Her 3 inch gun remained above water and, manned by gunners of the Royal Artillery continued to play an active role in the defence of the fortress. Imperial war Museum Negative No. E 4848. This is from my copy of Gunboat ! Small Ships at War by Bryan Perrett. I will scan the description of Ladybird's demise from the book, and E-mail it to you Ian. Thank you for your kind reply - and the picture of the Stuart - incidentally my middle name is Stewart - my mother's maiden name - she came from Speyside in the North of Scotland ! Is there any possibility of finding an archive copy of that newsletter ? Or have you already tried every route ?